No, it's not a crime novel but the tale of insurance giant Fairfax and its CEO's crusade against some very powerful hedge funds. Is it a quest for justice or an attempt to silence critics? Fortune's Bethany McLean investigates. (Fortune Magazine) -- July 26, 2006: Canadian insurer Fairfax Financial Holdings sues a group of hedge funds and research analysts for $5 billion in New Jersey state court, alleging a stock market manipulation scheme in which the funds sold Fairfax's shares short, got analysts to write negative research reports that pushed the stock down, and made fortunes. The list of some 20 defendants ranges from market wizard Steven Cohen, the ultraprivate multibillionaire who runs the $12 billion hedge fund SAC Capital, to the previously obscure Spyro Contogouris, who, according to the lawsuit, is an "operative for short-selling hedge funds that pay him to drive down the price of stocks." Nov. 14, 2006: The U.S. Attorney for the Southern District of New York announces the arrest of Spyro Contogouris. An affidavit filed by FBI agent B.J. Kang accuses Contogouris of "systematically defrauding" a Greek businessman of at least $5 million from 1997 to 2002. The charges are unrelated to Fairfax, but the company's stock soars 10 percent on the news, and its lawyer, Marc Kasowitz, says the charges "don't surprise us, given Fairfax's own claims against Mr. Contogouris and others for being engaged in a racketeering conspiracy." Kasowitz: He says Fairfax filed suit days before "a massive attack." Fairfax has sued a group of hedge funds and others alleging that they sought to drive down the company's share price. While the stock has been volatile, it climbed well above its lows when Fairfax filed its suit, and it has soared since then, inflicting losses on short-sellers. Morgan Keegan initiates coverage with an underperform rating, citing a multibillion-dollar loss-reserve deficiency. Fitch places Fairfax on negative ratings watch, citing "increasing liquidity pressures" and "decline in transparency of the management's public disclosures." Spyro Contogouris begins writing reports critical of Fairfax. Fairfax announces receipt of an SEC subpoena regarding its nontraditional and reinsurance transactions. Spyro Contogouris attempts to question former Fairfax CFO Trevor Ambridge. July Fairfax files suit on the 26th. The next day it announces a financial restatement that will reduce shareholder's equity. Spyro Contogouris is arrested in New York on charges of defrauding his former employer. Dec. 12, 2006: Carlos Mendez, a former Naval officer who is now a senior partner at Institutional Credit Partners, which manages a multibillion-dollar fixed-income portfolio, had complained to an FBI agent he knew that someone was following ICP's employees. He gets a call from the agent asking him to come in. When he arrives, an agent he's never met, B.J. Kang, greets him with some abrupt questions. "What hedge funds do you work with?" he asks. 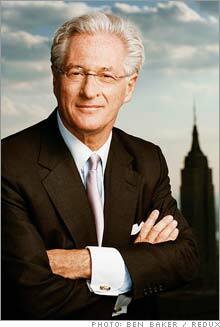 And then: "Why is Marc Kasowitz interested in ICP's employees?" The story of Fairfax, which had $6.8 billion in revenues last year, has more twists and turns than "The Departed." It reaches from the trading floors of some of the world's most powerful hedge funds to the offices of the FBI to havens of corporate secrecy like Bermuda, Luxembourg and Hungary. It involves financial machinations so complex that obfuscation seemed to be a business strategy, and the question isn't only whether the machinations are legal but whether anyone can even figure them out. This isn't just another squabble between short-sellers and their targets. If Fairfax and its CEO, Prem Watsa, are right - and some people believe they are - then greedy hedge funds are trying to bring down an innocent company, ripping off small investors. Fairfax (Charts) alleges that the defendants "engaged in an organized effort to destroy Fairfax" and have "reaped immense, ill-gotten profits." The allegations tap into fears about the secrecy and power of hedge funds and how they may use analysts and, yes, journalists to manipulate the market. Watsa insists that his lawsuit is not a referendum on short-selling - "I short stocks," he says - but rather about stopping a "smear campaign." Fairfax's suit claims that short-selling schemes have "targeted many dozens, if not hundreds, of other publicly traded companies." Last spring Kasowitz testified at a Senate Judiciary Committee hearing on the relationship between hedge funds and analysts, describing a "pervasive pattern of market manipulation" on the part of "certain extremely powerful hedge funds." But there is also the distinct possibility that Watsa and his company are not, in fact, victims - in which case the story is perhaps even more disturbing. After the last round of corporate scandals, regulators and the public cried out for more hardheaded analysis. Where were the skeptics, they asked? Now, just a few years later, there are skeptics aplenty about Fairfax, and they have taken their suspicions to regulators, rating agencies and others. Nor is Fairfax the first to use this new tool. Overstock.com (Charts) and Biovail (Charts) (also represented by Kasowitz) have brought similar suits. The suits are in their early stages, but a California court recently allowed the Overstock.com case to proceed. That ruling was troubling to those who believe critical analysis is vital to the markets. Of course, it's also possible that the truth resides in an uncomfortable place somewhere in the middle. Fairfax's lawsuit is stuffed with unsavory allegations that Contogouris and others "engaged in a long-term campaign of personal harassment" of Watsa, his family members and others connected to the company. But even such misconduct wouldn't mean that questions the skeptics raise aren't valid. Questions of financial impropriety are especially troubling at an insurer, where they can harm not only investors but also the policyholders who are counting on the insurer in case of disaster. And now, if an investor or policyholder were to seek help answering those questions, he or she would find only silence. Or rather, mostly silence. Today there's a Rashomon-like quality to the Fairfax story, but that wasn't always the case. Watsa began creating the sprawling company now known as Fairfax Financial Holdings in 1985. Fairfax - the name stands for "fair, friendly acquisitions" - was a phenomenal success, with a stock that soared from about $3 in 1985 to a high of over $600 in 1999 (all the figures in this paragraph are in Canadian dollars). Watsa was called the "Warren Buffett of Canada." But unlike Buffett, Watsa built his empire via progressively larger acquisitions of troubled property and casualty insurers. It was risky, because if you buy insurers that have done a bad job of underwriting, losses can snowball for years. That's what happened at Fairfax. In the late 1990s the Toronto-based company bought companies like Sphere Drake, which had operations in London and Bermuda and had exposure to asbestos claims, and the U.S.-based TIG, which had big workers' compensation claims. Watsa had to increase Fairfax's reserves repeatedly and put some of the European businesses and, eventually, a large part of TIG into "runoff," meaning they stopped writing new business and merely paid claims on existing policies. Watsa had another problem: short-sellers - investors who borrow shares and sell them, hoping to buy them back at lower prices in the future, betting the company's stock price will fall. To the shorts Fairfax looked as if it were headed for serious trouble, if not bankruptcy. By early 2003 more than two million Fairfax shares were sold short. In conference calls and annual meetings, Watsa assured investors that he was taking steps to fix Fairfax's problems. He remained upbeat, describing results most quarters as "excellent" or saying that he was "very pleased." In general, even a troubled insurer can avoid collapse for a long time if it can sustain the confidence of the market and keep cash coming in the door. But the company continued to struggle. What money Fairfax made came from investing activities. As any student of Buffett knows, insurance companies get most of their profits by investing policyholder premiums. And Watsa seems to be a superb investor. Over the seven years through 2005, Fairfax booked $2 billion in investment gains, and another $3 billion in interest and dividends. But Fairfax has also been hit with huge claims from events like the Gulf Coast hurricanes, and the losses from operations that Watsa put into runoff have continued - in 2005 they totaled more than $600 million (before taxes). On a conference call in early 2006, Watsa conceded that "over the past seven years, on a cumulative basis, we have barely been profitable." Short-sellers and other skeptics argued the situation was even worse. Fairfax's reserves still weren't adequate, they claimed, and the company's heavy use of a controversial product known as finite reinsurance (the same product whose abuse would result in the indictments of former executives of both AIG (Charts) and General Re in the fall of 2006) was artificially boosting Fairfax's earnings while camouflaging the amount of its leverage. And they complained about indecipherable transactions among offshore affiliates. The critics said Fairfax was so weak that it would not be able to pay all its claims.